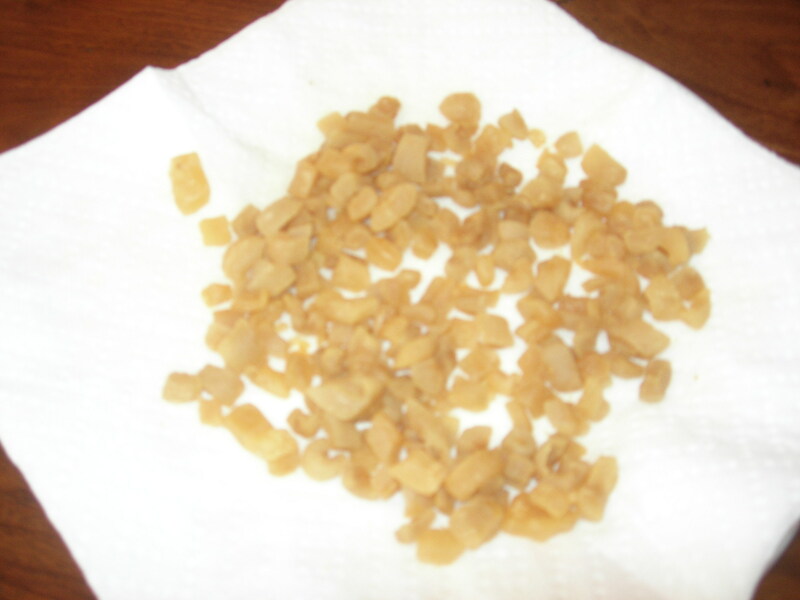 Chicharones–the little crispy pieces that are left after you render pork fat into lard. I had no idea how good they could be! When you make them at home, they taste like the lightest possible bits of crunchy bacon fat! So I wanted to come up with a way to use them the same way we might use bacon bits, but in a simple supper dish. 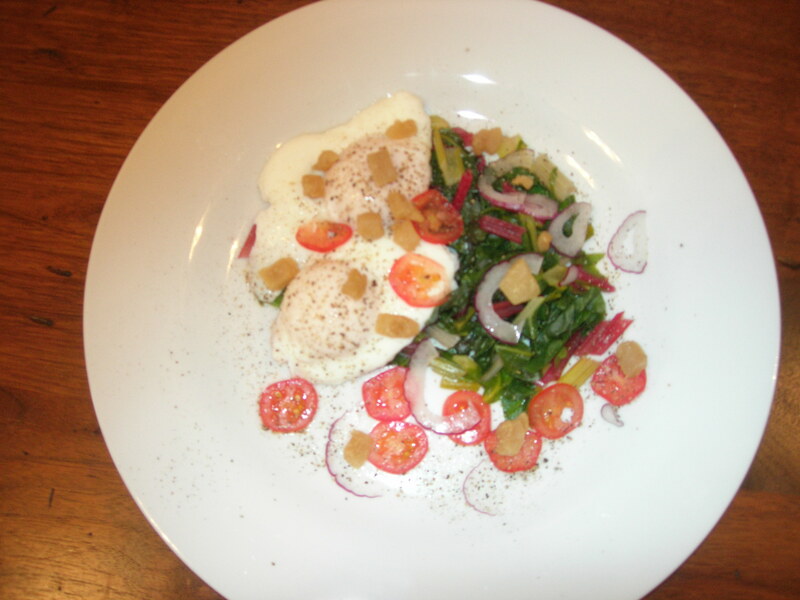 I decided to have poached eggs with chard, garnished with chicharones. So I went out to my tiny garden and collected about six big leaves of rainbow chard. After washing and drying the leaves, I cut the stems into 1/2″ long pieces, then cut the leaves cross-wise into 1/2″-wide ribbons. I started two pots, one to steam the chard and one to poach the eggs. (We’ll have all the fat we need from the pork bits!) For the chard, I put a steamer basket into a small pot, added water almost up to the level of the bottom of the steamer, and, once the water started to boil, turned it down to a bare simmer and put the cut chard stems in. I let them steam, covered, for two minutes while I broke two eggs into individual cups and, once the water reached a very low simmer in the second pot, slipped them straight into its hot water. Then, back to the chard pot, I added the chard leaves to the stems and covered the pot again; both the chard and the eggs simmered for about four minutes more. Done! I used tongs to transfer the chard leaves and stems to the plate, then used a strainer to fish out the poached eggs and pile them on. I added a couple of drops of sherry vinega r to the chard, and kosher salt and fresh-ground pepper over both eggs and chard. Finally, I shaved a cherry tomato and bit of red onion into paper-thin slices and added them. Then I sprinkled the dish with my fresh home-made chicharones. Bacon and eggs! (–Re-thought). This entry was posted in Recipes and tagged chard, chicharrones, cracklings, cracklins, poached eggs, pork rinds by judyramey. Bookmark the permalink.